MP3 Tester examines your MP3 file to ensure that they meet the standards that you set. Tests include bit and sample rates, ID3 tag fields, file numbering and frame integrity. 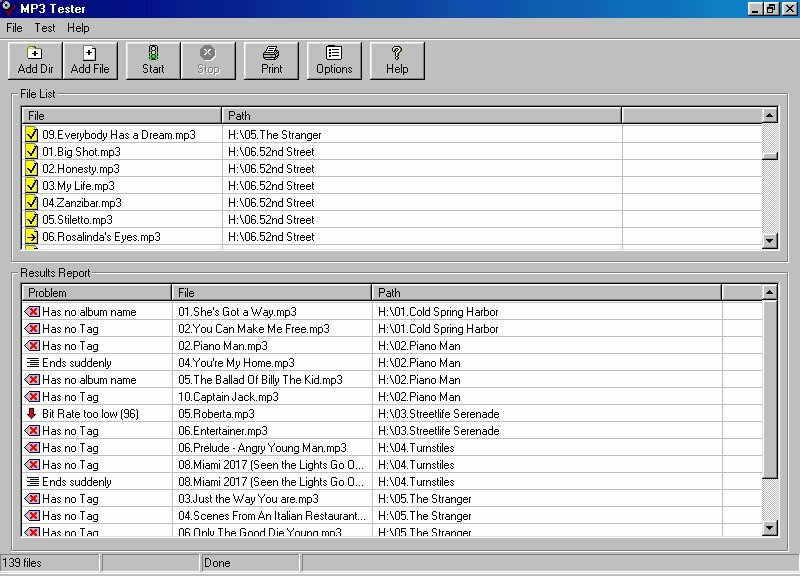 MP3 Tester also implements DSP techniques to test if your files end prematurely.You're stuck with a CD with low quality, clicking or partial songs. How annoying! Too bad you didn't have the time to listen to all of the songs before you burned the CD. ...... You're stuck with a CD with low quality, clicking or partial songs. How annoying! Too bad you didn't have the time to listen to all of the songs before you burned the CD. With MP3 Tester you can test the quality and integrity of your files before burning. * Ensure bit rate is in specified range. * Ensure sample rate is in specified range. * Ensure file length and size are in specified range. * Ensure ID3 tag fields exist (Track, Album and Artist name). * Ensure file does not end prematurely. * Check for presence or absense of attached picture tag. * Check for presense of absense of lyrics tag. Qweas is providing links to MP3 Tester 1.04 as a courtesy, and makes no representations regarding MP3 Tester or any other applications or any information related thereto. Any questions, complaints or claims regarding this application MP3 Tester 1.04 must be directed to the appropriate software vendor. You may click the publisher link of MP3 Tester on the top of this page to get more details about the vendor.